The China Beat: Kung Fu Panda, Go Home! It seems that boycott fatigue has finally hit the Chinese, in a year that has lurched from one boycott to another—against such entities as a French supermarket chain, a Hollywood star, and an American cable channel. When the latest clarion call was issued by a performance artist named Zhao Bandi赵半狄 against Kung Fu Panda, he was greeted with jeers and mockery. Zhao presented his case in a blog: Hollywood is morally corrupt for churning out loathsome personalities like Sharon Stone (who betrayed schadenfreude over the Sichuan earthquake as “karmic retribution” for Tibet) and Steven Spielberg (who quit his role as artistic advisor to the Olympics over Sudan). Therefore it should not be allowed to profit, in China, and so soon after the earthquake, from China’s most iconic “national treasure” (国宝)—the panda. And for Chinese to help line the pockets of the Hollywood reprobates would be tantamount to stripping valuables off the bodies of the quake victims. 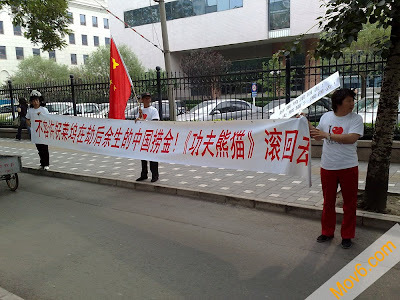 The banner that Zhao strung up outside the State Administration of Radio, Film, and Television, telling Kung Fu Panda to go home (《功夫熊猫》滚出去！), was taken down within 20 minutes by plainclothes police (see picture above). The movie opened in multiple cities on June 20 as scheduled to huge mirthful crowds. But Zhao’s effort was not a complete failure: the release of the movie was delayed for one day in Sichuan—home of the panda reserve and site of the earthquake—over concerns about possible “misperceptions” and hurt feelings. For this minor victory, Zhao received a phone call from an irate Sichuanese who gave him a bank account number and demanded that a suitable sum be deposited into it. For what? To compensate for the psychological loss he allegedly sustained for being prevented from enjoying the movie simultaneously with his dear compatriots throughout the rest of the country (全国人民)! Most of the detractors simply regarded Zhao as a clown and a hypocrite, asking tongue-in-cheek if he had come down with a case of “boycott disease” (抵制病), or if he was jealous of Hollywood’s high-tech virtuosity. Zhao has indeed made a name for himself (“the Pandaman” 熊猫人) with his panda-themed performance art, most notably a goofy line of black-and-white and furry fashion gear (picture below). Apparently his being Chinese not only entitles him to playful (and gainful) appropriation of his national patrimony, but also obligates him to guard it against profiteering interlopers. Given how favorably predisposed the Chinese generally were to the movie, it seems that Dreamworks has hit the right note in saying that the movie is intended to be a love letter to the Chinese and a tribute to Chinese culture. Audiences across China have indeed been duly pleased (and tickled) by the movie’s clever blend of made-in-Hong Kong kungfu lore, Chinatown chinoiserie, American teenage humor, and state-of-the-art animation technology. Commentators can’t seem to get over the realization that a didactic story （励志）could also be so fun, unlike so many Chinese-made “main-melody” (主旋律) fares featuring humorless, grandstanding heroes. Of course, the tried and true technique of defamiliarization is key here: a wok may be just a wok in a Chinese movie, but in Kung Fu Panda it is also a fight prop and hence an ingredient of hilarity. Other everyday objects too tumble through a riotous kungfu career: noodles, dumplings, chopsticks, and whatnot, cooking up a pandamonium unlike anything the Chinese audiences are accustomed to—with perhaps the exception of Stephen Chow’s manically droll Kungfu Hustle. The subversion and parodying of kungfu movie conventions doesn’t stop with substituting woks and chopsticks for swords and nunchakus. Genre bending seems to come with the territory of global mass culture. If Zhao Bandi had spent some time pondering the losses and gains of commercialized cultural borrowing, including his own, he might come to see the movie not as the battered victim of cultural imperialism coming home to roost, but a celebration of middle-class values—hardworking and having faith in yourself—and a dramatization of the middle-class predicament—to live a life of ordinary fulfillment (such as carrying on the family noodle soup business) or to pursue lofty ambitions (such as becoming the dragon warrior and savior of the realm). These values and predicaments can hardly be stamped Chinese. They are rather the stuff of a bourgeois fairytale in an amusingly exotic (or, shall we say, multicultural) getup designed to ensure the movie’s global marketability. Po the panda is the classic involuntary hero, a burly version of Spiderman. Martial arts (kungfu), like Spiderman’s web or the Hulk’s gamma rays, is the magical force that enables the virtuous to triumph over the wicked who wields it for nefarious ends. Yet Kung Fu Panda does Americanize the kungfu genre far more radically than, say, Ang Lee’s Crouching Tiger, Hidden Dragon. This it does by playing fast and loose with a crucial genre device. On the surface, both movies honor the idea that supreme martial arts skills can be codified in writing and that the book—the Holy Grail of kungfu—is usually hidden in some secret location or jealously guarded by an impartial agent. In Crouching Tiger, Jade Fox steals the secret manual from her master because he would not transmit esoteric Wudang techniques to a female disciple. She then uses it clandestinely to train her young aristocratic mistress Jen to fight. However, she does not know that Jen is stealthily studying the text of the manual whereas she, being illiterate, can only make out the pictures. As a result, Jen blindsides Jade Fox when they are pitted against each other in a match. The assumption is that writing encodes greater cosmic-martial truth than image. Those who can read attain higher occult power than those who can only view. While this may sound hopelessly snooty in the age of YouTube, the basic idea still resonates in Chinese cultural spheres. Variations of this idea can be found in most Chinese-language kungfu movies. The literary and martial arts are taken to be two sides of the same cosmic coin, or the Way. Both are said to be inspired by the tracks and movements of birds and beasts. Hence the same metaphors and protocols inform both the civil and martial domains, invariably urging the harmony of heaven, earth, and man. Zhang Yimou rehearses this idea to a fare-thee-well in Hero. In that movie, the king becomes enlightened of the essence of swordsmanship by mediating on the majestically rendered calligraphic character for “sword” (劍). Such hyperbole can strike an uninitiated viewer as all very “mystical and kungfu-y” (Po’s complaint against Master Shifu the red panda), if not downright silly. But a bona fide kungfu flick really can’t do without it. Just ask any kungfu junkie. Interestingly, Crouching Tiger almost went without this essential device. James Schamus recalled that after his Taiwan-based scriptwriting partners perused his initial draft, they wanted to know where “the book” was. Apparently not understanding the special status of writing in Chinese culture, he had done away with “all the bother about who has the book, who stole the book, who understood the book and why the book was variously hidden, coded, burned, memorized, etc.” In the end, he was glad that his collaborators insisted on putting the book back in. Thus a homely American self-help maxim (dubbed “Hallmark-Fu” by a British reviewer) steals the thunder of oriental mysticism. Intriguingly, the image of the wordless scroll evokes the point I made in an earlier post about the ring as the forbidden symbol of power in the Lord of the Rings trilogy. There I suggested that the imperative to destroy the ring is connected to the idea that power in a democracy is in theory an empty place. Here, the secret that is supposed to empower whoever possesses it once and for all turns out to be a hoax, so to speak. The hero (Po) and the villain (Tai Lung the leopard) are forced to fall back on their native moral endowments and painstakingly acquired martial capabilities. The quest is turned inward. And the true hero prevails because of the nobility of his purpose and because the people are on his side, not, in the last analysis, because he has the book. Such is the coup pulled off by Kung Fu Panda against the genre to which it also pays earnest tribute. Audiences of course can enjoy the movie for whatever reasons, but at least part of the pleasure, I suspect, is coming from its cheeky deflation of the ponderous mood that sometimes weighs down the kungfu genre. If anyone should be upset about the movie, it should be the diehard kungfu aficionados. The movie has so upped the ante that future makers of kungfu movies will have to think twice before they whip out the ubiquitous book, however much it is rooted in Chinese cosmology. In this sense, Kung Fu Panda is a disarmingly cute and merry face of the global modernity that has made it impossible for anyone to lay claim to beloved cultural symbols as inviolable national patrimony. "Kung Fu Panda" has more in common with the "kungfu" works of Jackie Chan, Gordon Liu etc. Those latter movies can be interpreted as perpetuating a middle-class self-improvement morality tale, but it's difficult to deny that they're any less Chinese than "wuxia" and that genre's emphasis on literary prowess. Interesting post. Just a quick note though; the scroll being blank is not really drawing upon 'Hallmark-Fu', although it may appear as such to westerners (much like the Dragon scroll, we each see ourself, perhaps). In actuality, it draws much more heavily upon Chinese Taoism and (especially) Chinese Buddhism. Consider, for example, the 'Journey to the West', where the four heroes initially receive a bundle of blank scrolls from Buddha after their journey. When they found out and indignantly confront Buddha, he informs them that the blank scrolls are actually the real scrolls, but he will provide them with 'lesser' scrolls that have writing on them. The notion of blankness/emptiness actually being superior, or representing a higher level of understanding than that which is written, is actually quite well embedded in Chinese lore and legends. So it isn't nearly as foreign or novel a concept as you seem to have considered it to be, and it's not at all a large leap for Chinese people to embrace it in Kung Fu Panda. This is the first thing I thought of when considering the idea of a blank scroll. In Daoism words (name) can never capture the truth. I don't think you've understood the performance art of Zhao Bandi,in fact,as being mocked by the mass,his boycotting was really a mockery to those "Patriots" who boycotted Carrefour under an irrational nationalism passion. I don't see much respect for 'Daoism,' by which zhangsan means Loa-Zhuang thought, in modern Chinese culture. Daoism is a catch-all phrase for non-buddhist traditional Chinese culture, from mythology and alchemy to medicine and philosophy. Daoism can mean the search for the golden pill of immortality or the effort to accept the inevitability of death. The people I talk to think Lao-Zhuang is non-condusive to success, it promotes laziness. In 6 years I've never heard anyone mention or praise Lao-Zhuang. Foreigners always over-mystify China. Most of the people here believe in nothing but the welfare of their family and maybe a modicum of superstition. You have to remember that there are virtually no ideals that are totally foreign to any given culture. For example stoicism holds most of the same values as lao-zhuang or zen, although like lao-zhuang, it is not well understood and plays no important part in modern culture. The writer is correct that the blank scroll draws more on the writer's own cultural sensibility than Laozi. I think the writer used the term kungfu genre so as not to confuse the majority of people who wouldn't know what wuxia is. I dearly hope this performance artist was only making a comment on the boycott craze, China, like any country, needs social critics like that.